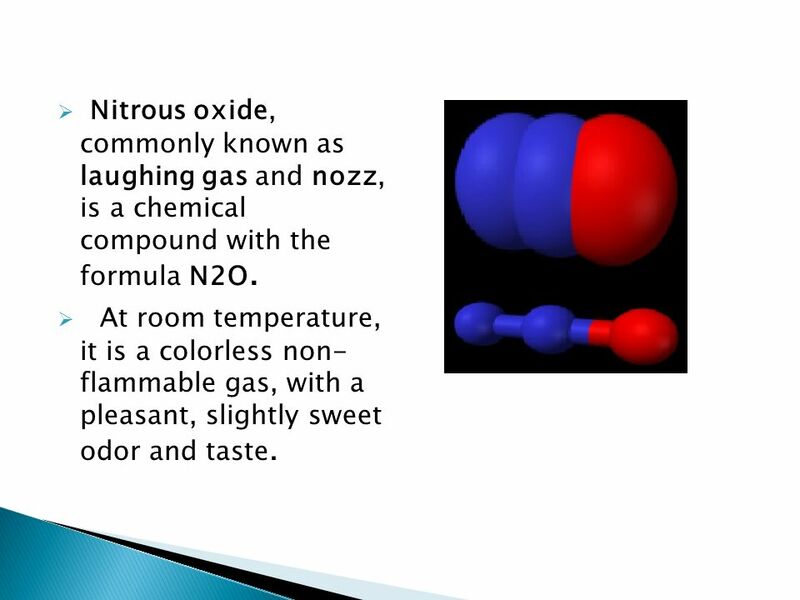 3 Nitrous oxide, commonly known as laughing gas and nozz, is a chemical compound with the formula N2O. At room temperature, it is a colorless non- flammable gas, with a pleasant, slightly sweet odor and taste. 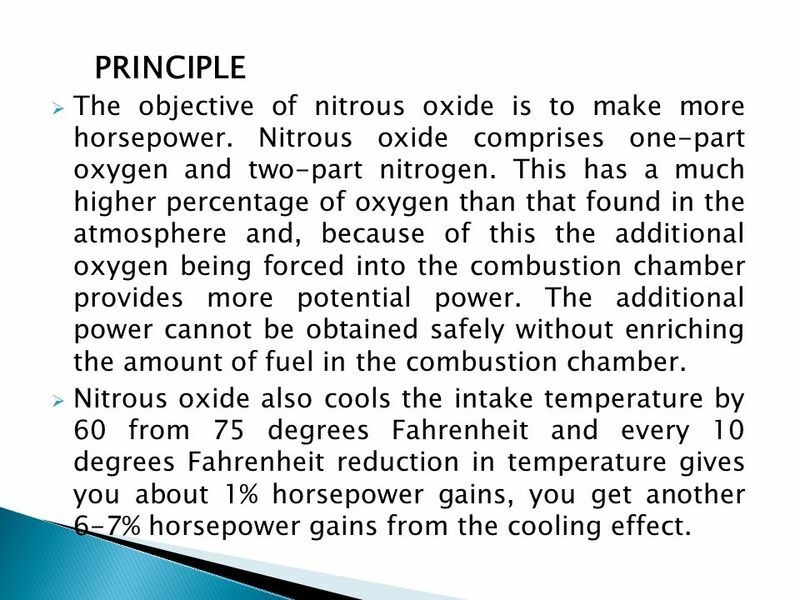 4 PRINCIPLE The objective of nitrous oxide is to make more horsepower. Nitrous oxide comprises one-part oxygen and two-part nitrogen. This has a much higher percentage of oxygen than that found in the atmosphere and, because of this the additional oxygen being forced into the combustion chamber provides more potential power. The additional power cannot be obtained safely without enriching the amount of fuel in the combustion chamber. Nitrous oxide also cools the intake temperature by 60 from 75 degrees Fahrenheit and every 10 degrees Fahrenheit reduction in temperature gives you about 1% horsepower gains, you get another 6-7% horsepower gains from the cooling effect. 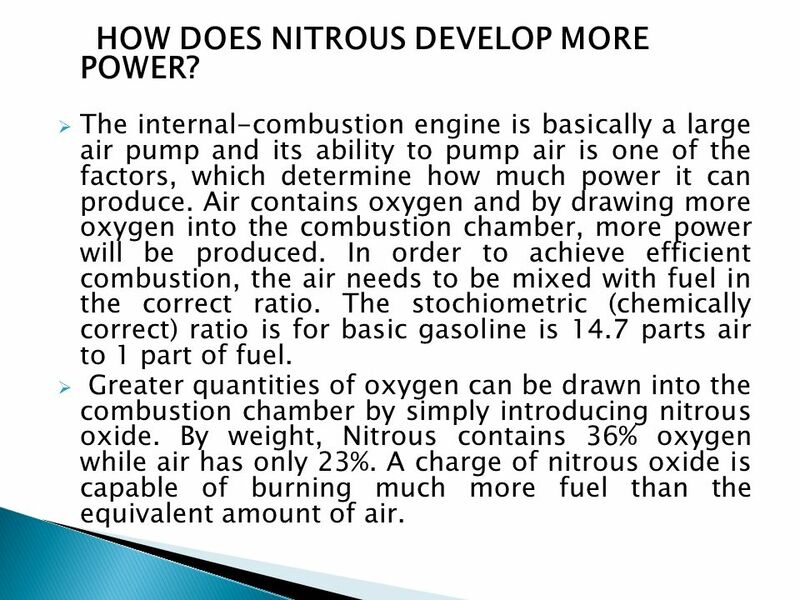 6 HOW DOES NITROUS DEVELOP MORE POWER? The internal-combustion engine is basically a large air pump and its ability to pump air is one of the factors, which determine how much power it can produce. Air contains oxygen and by drawing more oxygen into the combustion chamber, more power will be produced. In order to achieve efficient combustion, the air needs to be mixed with fuel in the correct ratio. The stochiometric (chemically correct) ratio is for basic gasoline is 14.7 parts air to 1 part of fuel. 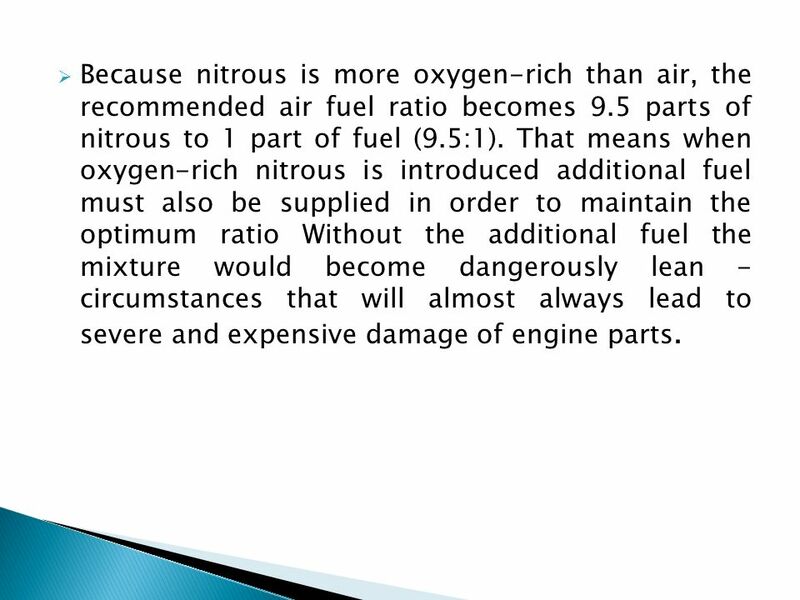 Greater quantities of oxygen can be drawn into the combustion chamber by simply introducing nitrous oxide. By weight, Nitrous contains 36% oxygen while air has only 23%. A charge of nitrous oxide is capable of burning much more fuel than the equivalent amount of air. 7 Because nitrous is more oxygen-rich than air, the recommended air fuel ratio becomes 9.5 parts of nitrous to 1 part of fuel (9.5:1). That means when oxygen-rich nitrous is introduced additional fuel must also be supplied in order to maintain the optimum ratio Without the additional fuel the mixture would become dangerously lean - circumstances that will almost always lead to severe and expensive damage of engine parts. 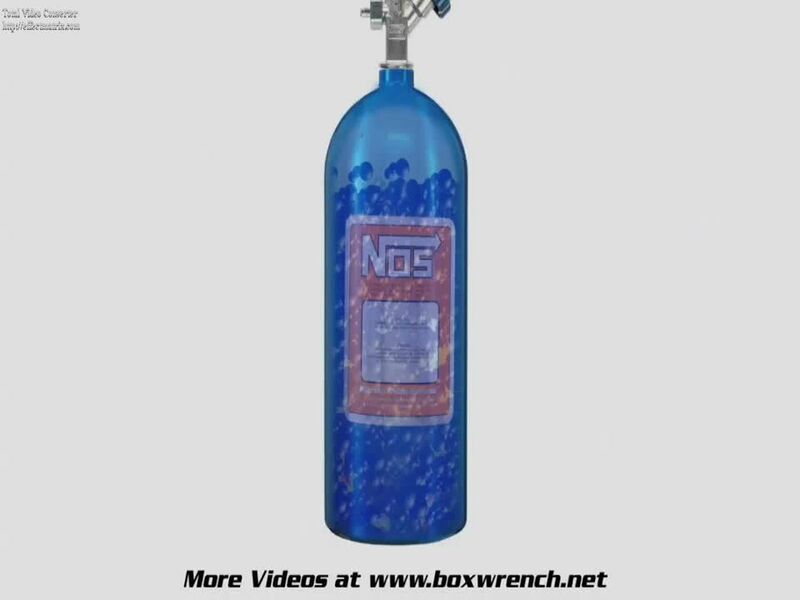 8 NITROUS STORAGE For racing purposes, nitrous oxide is usually contained in an aluminium cylinder; available in a variety of sizes ranging from 2.5 lbs to 20 lbs. 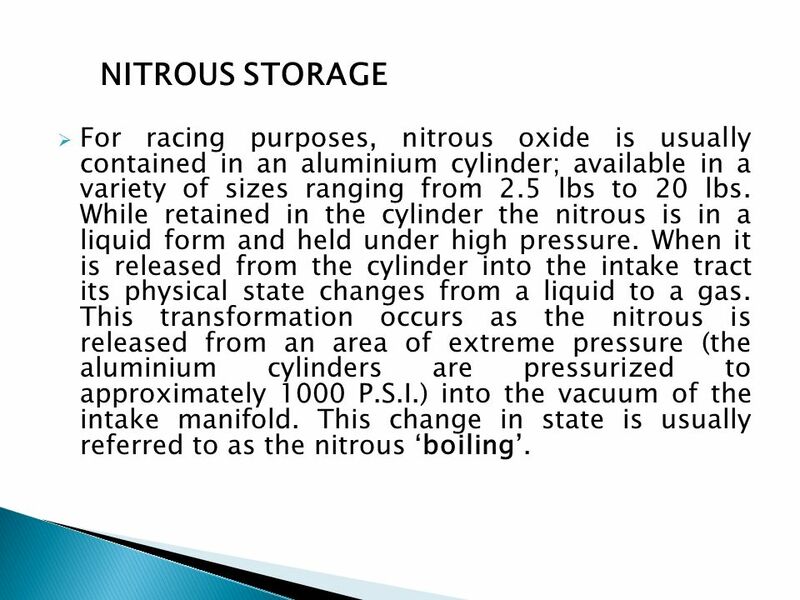 While retained in the cylinder the nitrous is in a liquid form and held under high pressure. When it is released from the cylinder into the intake tract its physical state changes from a liquid to a gas. 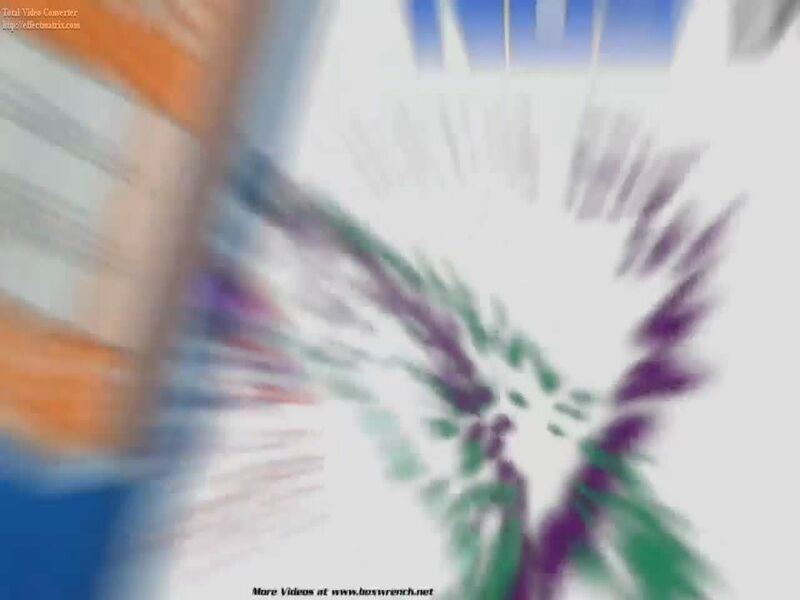 This transformation occurs as the nitrous is released from an area of extreme pressure (the aluminium cylinders are pressurized to approximately 1000 P.S.I.) into the vacuum of the intake manifold. This change in state is usually referred to as the nitrous ‘boiling’. 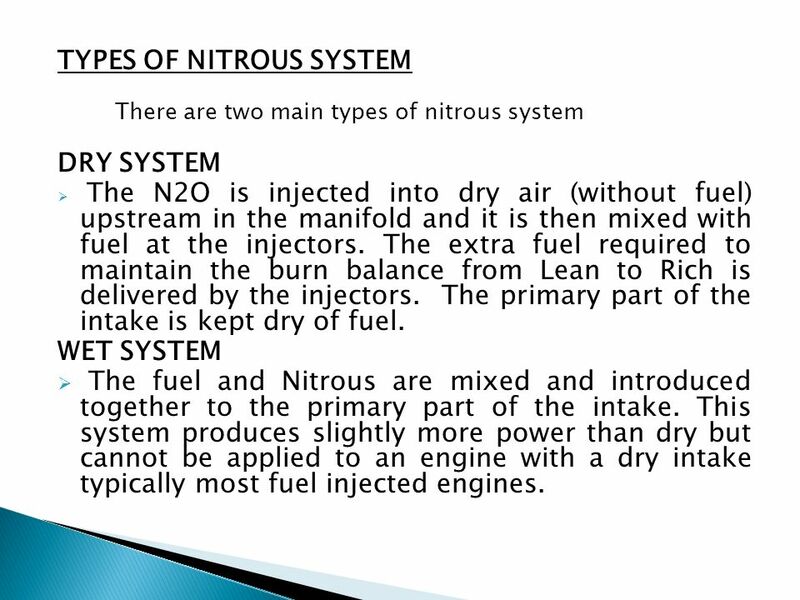 There are two main types of nitrous system DRY SYSTEM The N2O is injected into dry air (without fuel) upstream in the manifold and it is then mixed with fuel at the injectors. The extra fuel required to maintain the burn balance from Lean to Rich is delivered by the injectors. The primary part of the intake is kept dry of fuel. WET SYSTEM The fuel and Nitrous are mixed and introduced together to the primary part of the intake. This system produces slightly more power than dry but cannot be applied to an engine with a dry intake typically most fuel injected engines. 12 SAFETY ASPECTS One of the most important aspects of keeping an engine healthy when using nitrous oxide is to ensure it operates at the proper air/fuel ratio. Running too lean can cause detonation, resulting in damaged engine parts. Running too rich can also harm performance and destroy engine parts, too. Once calibrated, they'll inject the proper amount of fuel with the nitrous system to maintain the correct air/fuel ratio. 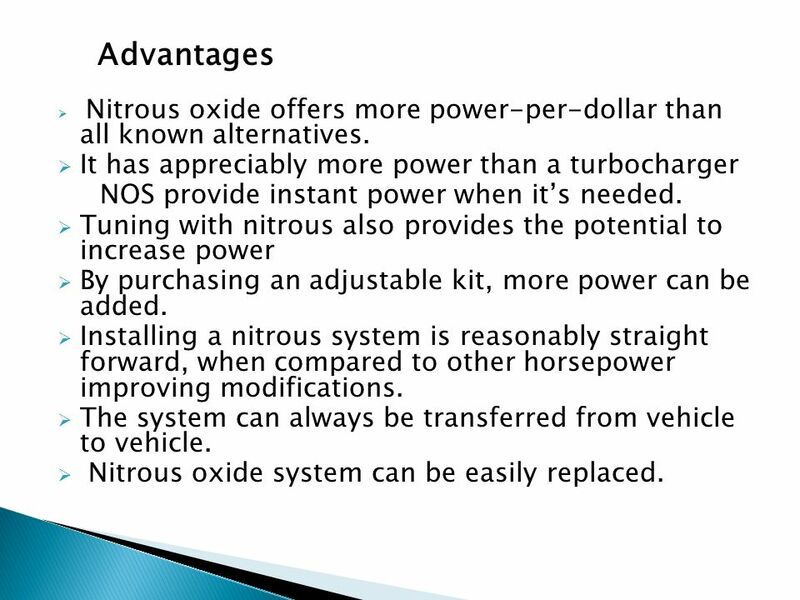 Nitrous oxide offers more power-per-dollar than all known alternatives. It has appreciably more power than a turbocharger NOS provide instant power when it’s needed. Tuning with nitrous also provides the potential to increase power By purchasing an adjustable kit, more power can be added. Installing a nitrous system is reasonably straight forward, when compared to other horsepower improving modifications. The system can always be transferred from vehicle to vehicle. 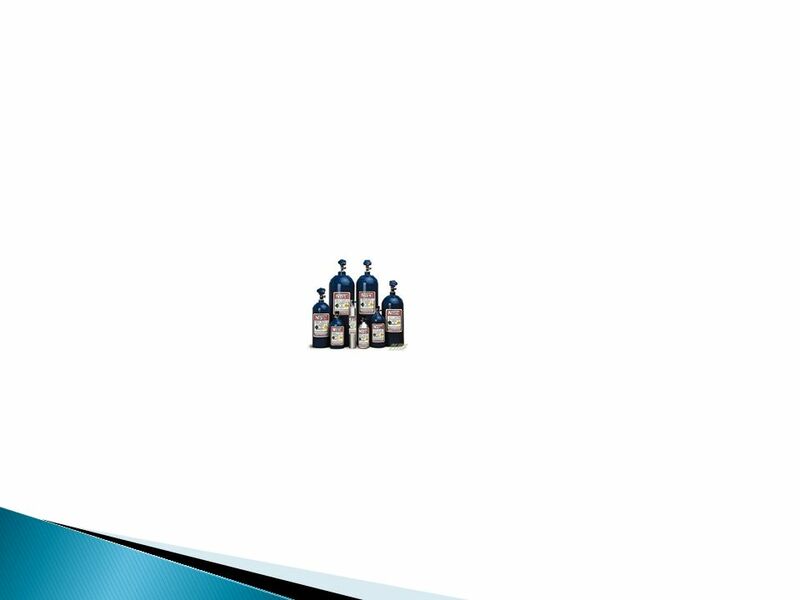 Nitrous oxide system can be easily replaced. 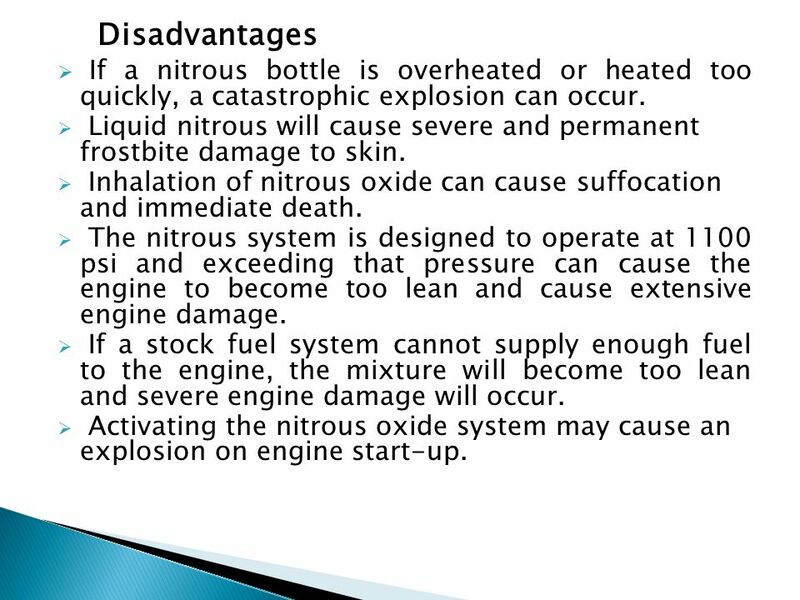 14 Disadvantages If a nitrous bottle is overheated or heated too quickly, a catastrophic explosion can occur. Liquid nitrous will cause severe and permanent frostbite damage to skin. Inhalation of nitrous oxide can cause suffocation and immediate death. The nitrous system is designed to operate at psi and exceeding that pressure can cause the engine to become too lean and cause extensive engine damage. If a stock fuel system cannot supply enough fuel to the engine, the mixture will become too lean and severe engine damage will occur. 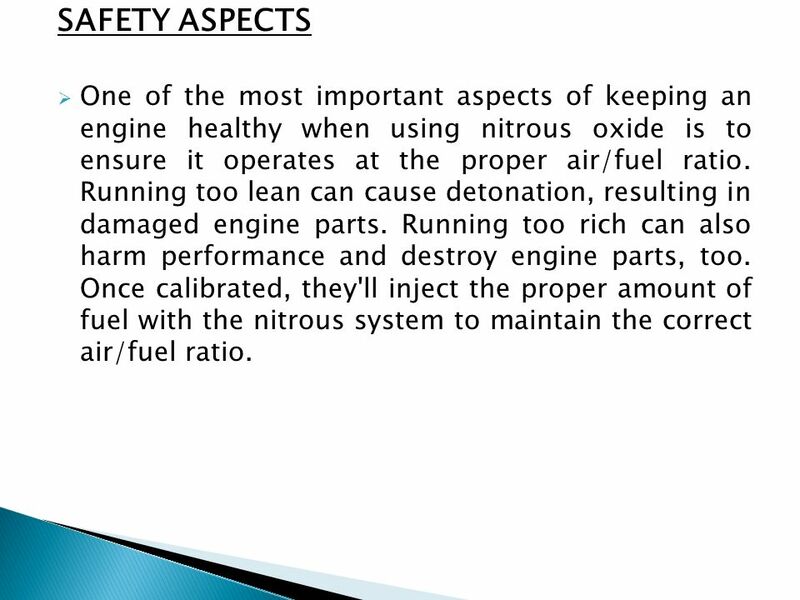 Activating the nitrous oxide system may cause an explosion on engine start-up. 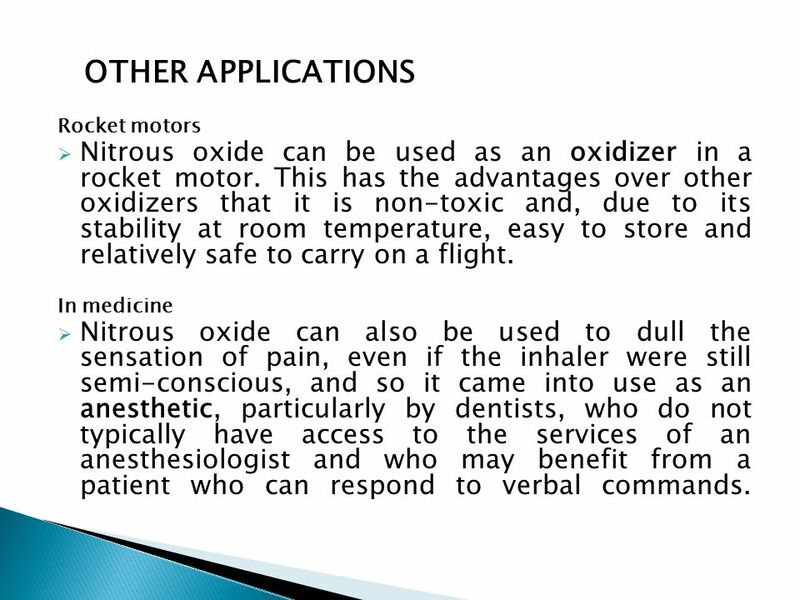 15 OTHER APPLICATIONS Rocket motors Nitrous oxide can be used as an oxidizer in a rocket motor. This has the advantages over other oxidizers that it is non-toxic and, due to its stability at room temperature, easy to store and relatively safe to carry on a flight. In medicine Nitrous oxide can also be used to dull the sensation of pain, even if the inhaler were still semi-conscious, and so it came into use as an anesthetic, particularly by dentists, who do not typically have access to the services of an anesthesiologist and who may benefit from a patient who can respond to verbal commands. 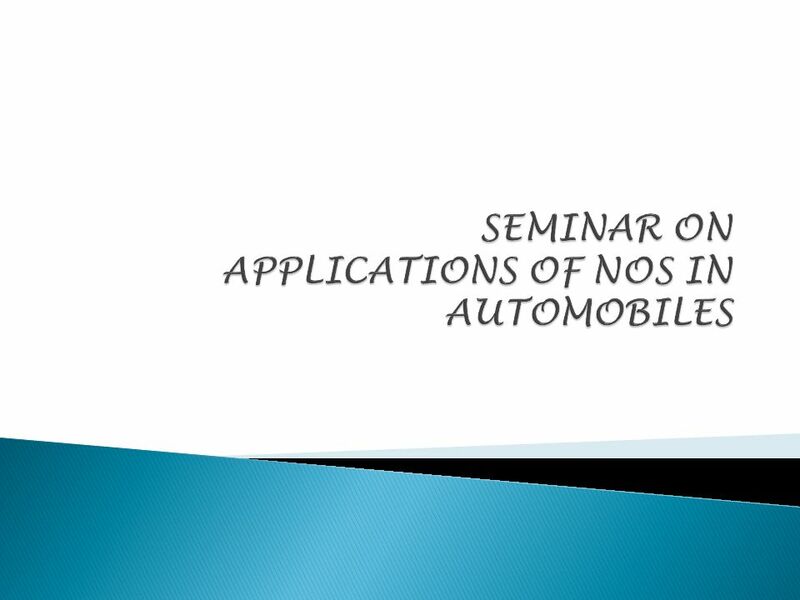 Download ppt "SEMINAR ON APPLICATIONS OF NOS IN AUTOMOBILES"
REFRIGERATION Refrigeration may be defined as the process of removing heat from a substance under controlled conditions and reducing and maintaining the. Hydrogen as Fuel Automotive Uses. 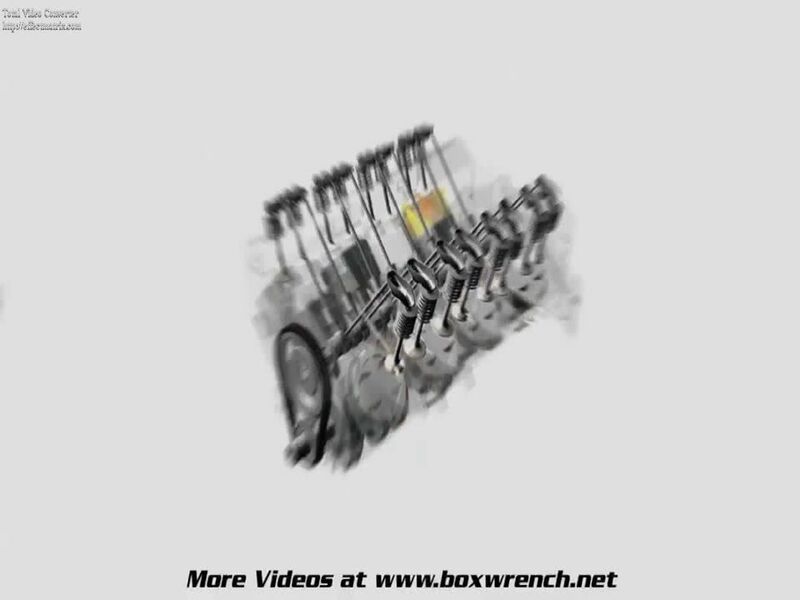 5 Principles of Engine Operation, Two- and Four-Stroke Engines. 3.7.4 Student Book © 2004 Propane Education & Research CouncilPage Identifying Testing Procedures for Anhydrous Ammonia (NH3) Contamination Because. Higher Chemistry Unit 2(a) Fuels. Petrol The gasoline fraction of crude oil is the main source of petrol. The gasoline fraction is obtained by the fractional. PROPERTIES OF FLAMMABLE MATERIALS. Flammability Flammable Flammable –Capable of being ignited and of burning –Synonymous with combustible. 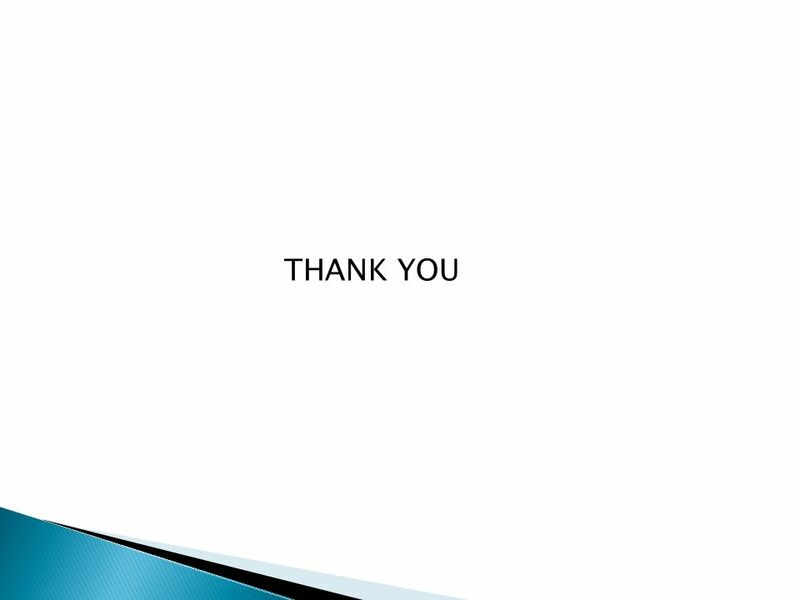 Hydrogen Fuel Cells as an Alternative Automobile Power Source By Kenneth Noyce Physics 3150 Energy and Sustainability. Combustion Phenomena Since the gasoline powered internal combustion engine was invented, the quality of the fuel has been a limiting factor in the output. 1 Start Four Stroke, Two Stroke Diesel, & Wankel Engine Theory and Operation. 3.7.4 Student Book © 2004 Propane Education & Research CouncilPage 1 3.7.4 Identifying Testing Procedures for Anhydrous Ammonia (NH3) Contamination Because.